Scientists and engineers continue to push the envelope on the development of new vehicles entering the space satellite and launch business. Rocket Lab's new Electron rocket delivered three payloads to low-Earth orbit (LEO) for the first time on January 21. As evidenced by the rocket's name, Still Testing, and it's predecessor It's a Test, these vehicles contribute to ongoing technology development by putting the latest materials, manufacturing techniques, and avionics under the gun in real launch environments. On the opposite end of the payload-mass-to-orbit scale, SpaceX's long-awaited Falcon Heavy (FH) took to the sky in an excitingly nominal test flight on February 6. Although Falcon Heavy builds on the success of Falcon 9, sharing the majority of F9's architecture, there were still plenty of unknowns that could only really be tested during flight. "There's a lot that can go wrong there … it's guaranteed to be exciting,” as Elon Musk put it at the ISS Research & Development Conference last year. Despite their difference in size, Electron and Falcon Heavy share one thing in common: dummy payloads. I've come to expect provocative half-joking antics from Elon such as sending his Tesla Roadster into space atop FH, but something about Rocket Lab's disco ball Humanity Star and Peter Beck's dreamy statement about it rubbed me the wrong way. Have we reached a point where sending any old thing into space will do the job? Have we lost Carl Sagan's quasi-spiritual appreciation for space and humanity's place in the universe? Wait, aren't scientists mad about this? In this article I take a step back and look at the history and nature of dummy payloads before passing judgement on SpaceX or Rocket Lab, and examine the value of putting disco balls and electric cars into orbit. Cygnus Mass Simulator was used to represent the mass properties of the Cygnus spacecraft and collect data for the maiden flight of the Antares-110 rocket. Image credit Gunter's Space Page. Naturally, space launchers undergo rigorous testing at every stage of development, and the testing continues into the nominal life cycle through static fires and advanced ground testing. But the physics and environment characteristics of a launch are very intense, complex, and difficult to replicate on the ground. In some cases, aspects of a launch environment are not well understood (this was especially true early on in space history). To accurately simulate the behavior of a real launch, the booster needs to lift a representative mass. Rockets are meticulously designed and ride a fine edge of stability. If a rocket takes off with nothing inside the fairing, the physical dynamics of the system are way off and who knows what could happen. An additional bonus to using a dummy payload is to refine the launch process itself. The dummy serves as a practice run for the whole cycle of integration, test, and launch. Failure of Falcon 9 AMOS-6 mission during static fire last year. Image credit US Launch Report. When you've got hundreds of thousands of kilograms of rocket fuel and oxidizer sitting on the pad and intend to make it explode in one direction (but not too quickly) with extreme precision, it's pretty easy to understand why you wouldn't want to put something super important on top. Risk is always a major factor in mission design. How much time and money someone is willing to put on the line depends on the nature of the mission. A university Cubesat program might accept a large amount of risk because they value the design and test process more than the outcome. The Air Force Research Lab might have a mission where success is paramount, and can afford to pay a premium for guaranteed mission success in order to mitigate risk at every possible opportunity. In the case of Falcon Heavy or Electron, the high risk situation begins at the pad. Even filling the propellant tanks has its own associated risks. Many rehearsals and static fires build confidence, but as the AMOS-6 catastrophe made clear, every moment the rocket sits on the pad could be dangerous for the payload. A dummy payload is, in a sense, a throwaway from the start. The lower the stakes the calmer everyone can be, and if the whole thing explodes it's not a big deal. From a completely logical perspective, it doesn't make much sense to spend money on something you half-expect to be blown up. Let's say you take a super conservative approach and end up putting a lump of iron in your fairing. The iron block has all the same mass characteristics of a usual payload, and zero risk if it is burned to a crisp. You launch. If the dummy payload does make it to orbit, you can bet that you will have wished you spent a little more money on your dummy payload to make it /somewhat/ useful, because now you have to do a whole other (expensive) launch to get any value from the mass you sent into orbit. Obviously, there is a tradeoff here. The more time and money you spend on that dummy mass, the less tolerant you might be to the risks involved. However, risk tolerance exists on a spectrum, and clever mission designers can work it to their advantage. A clear example is SpaceX's booster landing tests. SpaceX delivered payloads to orbit in a completely nominal, low-risk fashion. After completing the delivery they were paid for, the Falcon 9 booster tested out recovery and landings out at sea. Landings were extremely risky, but nothing was really at stake. Of course, boosters didn't start making landing attempts at the launch site until the risk of failure was proven to be viable at sea and thus very much reduced. Saturn I test flight SA-3 carrying the second Project Highwater experiment. Video credit Mark Gray and NASA. In 1962, NASA engineers were hard at work developing what would become Saturn V, the most powerful rocket of all time, to bring astronauts to the Moon. Design and analysis was done by the computation power of human brains put to their limits. Even the smartest minds found difficulty in predicting what would happen when Saturn's engines ignited. The solution: test it out. Saturn I was built and launched to test the first stage booster and its H-1 engines, ground support equipment, and the vehicle in flight. To simulate the mass of full upper stage tanks, NASA scientists devised /Project Highwater/, which was basically just filling the tanks with water instead of fuel. This let engineers test the first stage without worrying about upper stages causing problems. The launch of Saturn-Apollo 3 (SA-3) successfully tested the Saturn rocket's engines at full power and confirmed the rocket's capability of delivering the upper stages and capsule (via a mass simulator) to the right orbit. At 65 miles up, 22,900 gallons of water were released into the atmosphere, allowing NASA scientists to investigate the nature of Earth's ionosphere and the behavior of ice in space. Project Highwater is the classic example of a dummy payload. If the booster stage failed, all that goes with it is a few thousand gallons of water. When it succeeded, real science was gleaned from it. Granted, looking back at a mission from more than 50 years ago has its flaws. Today we know a lot more about rockets, and have a much broader body of scientific knowledge. Would releasing a bunch of water in the atmosphere gain as much science today as it did back then? Can we trust boosters more than we could back in the day? Starman leaves Earth after being launched by Falcon Heavy's first test flight. Image credit SpaceX. Falcon Heavy is SpaceX's answer to the need for super heavy lifters in the launch market, and the company's first vehicle capable of bringing payloads to Mars. 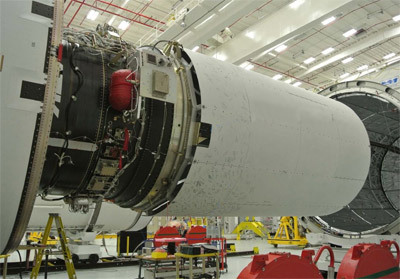 Officially announced in 2011, FH was pitched as three Falcon 9 first stage boosters strapped together. As Musk admitted in 2017, "It actually ended up being way harder to do Falcon Heavy than we thought. ... Really way, way more difficult than we originally thought. We were pretty naive about that." At launch, 27 Merlin-1D engines fired simultaneously. The two side boosters, each of which have flown and landed once before as Falcon 9s, separated from the main core in flight and returned to landing pads at the launch site. The center core continued on, then separate from the rocket's upper stage and crashed into the ocean while attempting to land on a drone ship at sea. The upper stage pushed the payload into a heliocentric orbit that intersects Mars's orbit, similar to what would be needed to send a payload to the red planet. Given that Musk appears to have low expectations for this test flight, it is not hard to understand why he decided to use "the silliest thing he can imagine" as the dummy payload: Elon's own Tesla Roadster. The car does contain any scientific sensors or instruments. 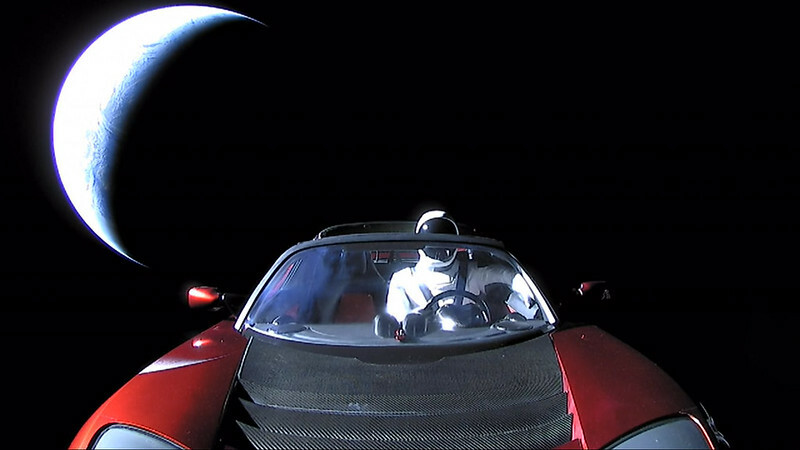 Instead it is "driven" by a mannequin wearing one of SpaceX's new flight suits, the car radio playing "Space Oddity" by David Bowie, complete with a towel and sign that reads "DON'T PANIC" as a nod to The Hitchhiker's Guide to the Galaxy by Douglas Adams. SpaceX announced during the FH launch stream that the Roadster also harbors an Ark: essentially a DVD equivalent to Voyager's Golden Record. Can't say I'm not a little disappointed by this one. Okay, I get that FH was very likely to explode at any point during flight and it's a SpaceX tradition to keep some humor in this type of thing (remember the wheel of cheese in Cargo Dragon's maiden flight?). Elon's roadster and all the essential Sci-Fi references are fitting. In the post-launch press briefing, Elon reminded the audience that it is good to have some fun with this kind of thing. But come on! No sensors? No telemetry? The only science gained from the payload here is verification that it enters an orbit that will be useful for sending future payloads to Mars. Very important, but independent of whatever the payload actually is. If only it could be a Red Dragon! Imagine a Crew Dragon capsule skin, some mass simulators and the same flight suit mannequin inside, a "DON'T PANIC" sign, all the same stuff. Falcon Heavy delivers a payload to the right orbit, and we get to dream about what it could be like to ship real payloads to Mars. Lastly, "Starman" driving the car is dressed in a qualification version of SpaceX's crew flight suit, identical to the ones that will be worn by astronauts or civilian passengers of Crew Dragon in coming years. Unfortunately, for whatever reason, SpaceX chose not to pressurize the suit or fit it with sensors and telemetry. What better test than to see how it performs exposed directly to a space environment? But this payload is not meant to be an experiment or an art installation. It serves as a monument. Some have argued that Elon's Roadster belongs in a museum, but I argue that the have done just that. The car will orbit the sun, likely unperturbed, for millions of years if not more. It sits on a pedestal inscribed with the names of SpaceX employees. The Ark (and the car itself) are a time capsule of that moment of achievement and inspiration. Regardless of the payload, the merits to this flight test are in the launch. As payloads become more complex, more points of failure are introduced into the system. Only the rocket is under test! Still Testing successfully circularizes orbit using Electron's kick stage. Image credit Rocket Lab USA. On January 21, 2018, Rocket Lab launched Still Testing to test their new Electron rocket. Electron is designed to bring small payloads (sub 250 kg) to sun-synchronous orbit (500 km). Unlike Falcon 9, Atlas V, or Delta IV, where small payloads are likely to be secondary payloads, Electron is intended to directly insert small sats and cubesats into their desired orbits. One of the payloads riding on Still Testing was a kick stage. After separating from Electron's second stage, the kick stage fired a (previously unannounced) Curie engine to circularize its orbit. The kick stage could be used to deliver multiple payloads to different orbits from a single launch. The key part of this case is that the kick stage was previously unannounced. This is useful tech and demonstrated successfully. If the rocket failed, it would have been a waste but only internally. If the kick stage failed... hey, rocket science is hard. The Humanity Star was launched as a dummy payload aboard Still Testing. Image credit Rocket Lab USA. One extra payload aboard Still Testing was Rocket Lab CEO Peter Beck's "Humanity Star." The satellite is a carbon fiber geodesic sphere (1 meter in diameter), covered in reflective panels. The sphere was placed in a polar LEO orbit, circling the Earth every 90 minutes. The purpose of the Humanity Star is not a scientific one, but more like an art installation. Beck hopes to imbue a sense of wonder, connection, and scale in the everyday person when it is seen overhead with the naked eye. The satellite will remain in orbit for about 9 months after launch before burning up in the atmosphere. Unlike the kick stage, the Humanity Star is a dummy payload that served no scientific purpose. However, before anyone get's too uptight about putting a disco ball in space, one must not forget that it's been done before--by NASA. The LAGEOS mission was launched in 1976 and is still in orbit today. LAGEOS is a brass core fitted with many reflective aluminum surfaces. Scientists at NASA Goddard used reflections from LAGEOS to measure the movement of Earth's tectonic plates with millimeter precision and later develop a detailed model of Earth's gravity field. Another mission from history provides an excellent example of how a passive satellite can have significant influence on the general public's perception of space. Sputnik 1 was launched into an elliptical low Earth orbit in 1957 as the first artificial satellite. It's modest but persistent "chirp" announced its presence to the world. While Sputnik's radio signal chirp was a simple way to confirm its orbit for its Soviet creators, the signal could be heard by even civilian radio amateurs. A harmless demonstration, but opened the world's imagination to the possiblities brought about by space technology and bestowed a profound sense of smallness to those who heard it. The Humanity Star does not attempt to conduct any science, as performed by NASA's disco ball LAGEOS, nor is it a technology demonstrator like Sputnik. There is nothing scientifically or technologically proven by the Humanity Star that is not already demonstrated by launching its companion payload, Rocket Lab's kick stage. Beck and Rocket Lab claim to present a method of imbuing a peaceful inspiration of connectedness and humility as Sputnik once did, but done so in a completely inconsequential, arbitrary fashion. I predict will be soon forgotton after its nine month journey. The Humanity Star also claims to inspire civilians young and old, any place on Earth, to behold the wonders of astronomy by looking up at the same object in the sky. I don't dismiss that point, but I do ask if Beck has heard of one natural satellite known as the Moon, and another artificial satellite known as the International Space Station. Joking aside, there are multitudes of beautiful objects in the night sky, each with their own exceedingly interesting histories, visible to everyone on the planet. To experience a shared appreciation for celestial wonders, I invite readers to visit a gathering of their local amateur astronomy group, visit the space exhibits in their local museum, or even better, a planetarium. Educators and amateur astronomers are ubiquitously generous when it comes to showing newcomers the basics of astronomy, observing with a telescope, and learning about space. You don't need a Humanity Star to have an excuse to look up. But hey, as a dummy mass it did a pretty good job. Every dummy payload in a rocket test is an opportunity for science. Primary objective is without a doubt to simulate nominal payload dynamics with extremely low stakes. If it is lost, no big deal. We all half-expected that anyway. But if it survives, there is real value in its position. It's not cheap to get to space! The sweet spot in the risk/cost trade space for a dummy payload is in its simplicity. Remember, science was gained from letting water loose in the atmosphere during SA-3, and a ball of mirrors provided major geological insights with LAGEOS! The argument that a scientific payload must be expensive or complicated is a fallacy, and to launch something into space without attempting to conduct science is a waste.